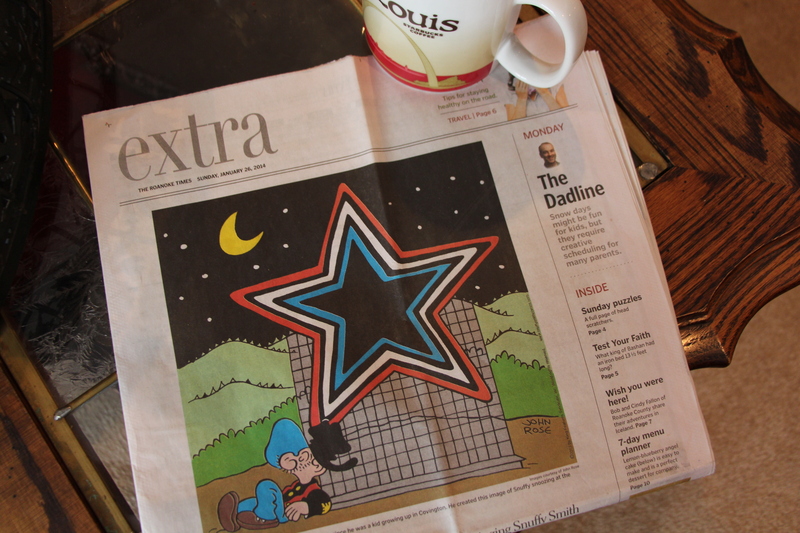 Since moving to Roanoke, Superman and I have taken up a new weekend morning habit, that of reading the paper. Every new place our family has moved, I’ve tried making newspaper reading part of my morning ritual. But until this move, I could never make it stick. Maybe it was the age of my children, or lack of interest in where I lived. Most likely, it had to do my—ehem—maturity level. For as much as I love reading, reading the news never held my attention. Often I didn’t even bother unrolling it from its delivered state. But for whatever reason, here in this new place and season of life I find myself excited for Saturday and Sunday mornings not only because I have a day or two of rest from my normal chaos (usually weekends are just a different kind of chaos), but because I get to read the paper. Proof that either: a) I am getting old, or b) living in a world that has is shifting increasingly towards the intangible, leaving me grasping for ways to physically interact with and find my place in the three-dimensional community around me. Probably it is a bit of both. 1) The smell of newsprint…Newsprint smells real—of the earth. It reminds me that life is organic, has dirt origins; also bone, sinew, blood, and brain. It is the same with the stories and the people within the paper’s pages. Not only are these people and their stories real, but I hold their reality in my hands as I read and smell the stories of their lives—a humbling prospect for sure. 2) The news is limited to what fits within the paper’s pages…I scan the sections and pages, put extraneous material in one pile (flyers and classifieds), the sports and business sections in another (for Superman), then slowly and deliberately read through the rest, undistracted by pop-up ads, flashing sidebars or links within the article begging me to explore like a rabbit trailing through Wonderland. I tear out that which I wish to remember (usually comics, artist spotlights and book reviews) attach them to my fridge, then contentedly fold up the rest of the paper and add it to the recycling bin, feeling like an informed, yet not overwhelmed, citizen. 3) The birth, engagement, wedding, anniversaries, and obituaries…Yes, I read these pages, even though I know none of the people within them. I study the pictures, wonder about relationships, families, their special day, or the mourning loved ones left behind. And as I do, I feel part of a community that pulses with life and health. It is not just the events calendar or ‘local scenes’ sections that create this sense of vibrancy in a community. Births, weddings, funerals—celebrations and grieving–this is the stuff of life; the miraculous heartbeat of the everyday, and as I read, my heart beats stronger, too. 4) The local arts and entrepreneurs’ scene…Sunday morning I read about the creator of the cartoon Snuffy Smith. He happens to live in a community not far from my own. Last week I read the story of a local brew-meister working overtime to open his own brewery, hoping to add his creation to an already impressive and growing list of excellent craft brews here in Southwest VA. These stories—these people–inspire me to participate in the creative culture of my new hometown, as partaker and more importantly, as creator. 5) My hands get dirty…When I am done reading the paper, my fingers are smudged with black ink. Sometimes, so is my nose, my forehead, and my shirtsleeves. But I don’t mind. I count it as proof I have engaged with my community—my place. Like dirt under my fingernails after gardening or pencil lead smeared up the side of my left hand after drafting a story, to be dirty is to be active. To be active is proof I still have passion and energy and potential for good. I love the smell and the sound of the pages. We get the paper delivered everyday, We do not have cable or netflix or video games- receiving the paper each day is our luxury item. I love it when my kids say-“I want the comics” and when Henry and Rob reach for the sports page at the same time. I am Hoping they will carry on the tradition of newspaper reading. Yes, Shari! And on top of that, I read the newspaper at my pace, not the pace of some website that decides to refresh itself while I’m in the middle of something. Tim, my husband often gets on Real Clear Politics or some of the other news sites and I always know which site he’s browsing by the pop-up ads. I will be deep into a book when all the sudden my ears are full of some loud advertisement…not fun. Sooo… What I meant to say was: …Unfortunately, the everyday demands of life left a stack of unopened, unwrapped, and unread newspapers piling up until I reluctantly cancelled the subscription. I do love reading the paper when I make time (I buy one on those days I intend to luxuriate on the couch or — even better — on the deck, just to catch up with the world in print). Those days are fewer and farther between than I like to admit. I do have fond memories of Sundays during my youth when the family would hang out together, each of us kids with portions of the “funnies”, and my parents reading whatever sections they enjoyed. I can see and hear in my mind the particular way my dad would snap the paper open and then fold it over to continue reading on another page. Yep, good times, good memories, good connection to the world and our community. Much preferable to following the rabbit trail of pop-ups and “related stories” that visually accost me when online. The newspaper doesn’t have the same way of grabbing your attention, making you look… but I feel certain it’s a form of media, a way of connecting that we need to preserve. I love your memories, Deb… somehow, I can’t quite picture the same sort of “coming together” and family nostalgia as I try to imagine everyone reading the news online together–haha! Just not tangible. Thanks so much for sharing your thoughts! I loved reading them!